Home » How Are Solar Panels Rated? New solar panel models come out every year and add themselves to an extensive market with hundreds of modules and technologies. However, when you go out to purchase solar panels, you might get overwhelmed with so many brands, models, and technologies. Establishing a rating system is essential for the industry because this allows solar panel’s buyers to compare performance between different modules, and it establishes an equal ground base for the development of the industry. That’s why the industry has established several ratings to measure and compare solar panels. These ratings are referred to lab conditions that test the performance of modules under specific parameters, equal to all manufacturers. The performance of the solar panel under such conditions will determine how good or bad it is compared to other models. We can divide these lab tests into two categories: STC and NOCT. Standard Test Conditions (STC) are referred to lab tests for solar panels evaluated in a solar simulator called flash tester. During the test, the modules are exposed to artificial sunlight with an irradiance equal to 1,000 W/m2. This irradiance value is associated with the maximum solar radiation typically at noon and assuming the Sun directly reaches the module. Moreover, the temperature of the module is established at 25°C and the atmospheric density or air mass is equal to 1.5 (shortest optical path length of sunlight through the Earth atmosphere). Nominal Operating Cell Temperature (NOCT) was established because STC tests did not represent real-world conditions under no circumstance. Therefore, NOCT acts as a better reference for utilities and other government entities of how the module would perform under normal or real-world circumstances, this allows them to establish rebates and tariffs more accurately. NOCT assumes irradiance values of 800 W/m2, an atmospheric density of 1.5, an ambient temperature of 20°C, an operating temperature of 45°C and a wind speed of 1 m/s to represent air circulation on the backsheet (ground mounted systems). All solar panel manufacturers must include in their datasheet the results of both STC and NOCT tests which outputs include: power, open circuit voltage, maximum power point (MPP) voltage, short circuit current, and MPP current. From these results, the most important one for reference in solar panel ratings is power. Solar panels can be rated according to their wattage or power output. Lately, the industry has been pushing forward new modules with 400 W output or more, however, the big market share of solar panels is generally located between 300 W and 400 W.
Some solar panel manufacturers still produce power outputs around 250 W that can have residential applications. Power outputs below 200 W are generally attributed with off-grid applications, for RV’s or battery charging. Here we can see average power outputs of several manufacturers from June 2018. 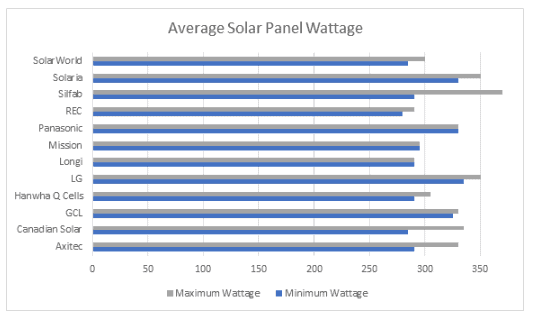 Average solar panel wattage as of June 2018. Maybe the most common solar panel rating is referred to efficiency. This parameter acts as a reference of how much solar radiation can be transformed into electricity, generally tested under STC. Given its importance, many homeowners, solar designers, and manufacturers rate the industry of solar panels according to the efficiency of modules. Only top-rated brands can produce the top solar panel efficiency, which is why every year there is a race or competition between manufacturers to release the ultimate and most efficient solar panel. 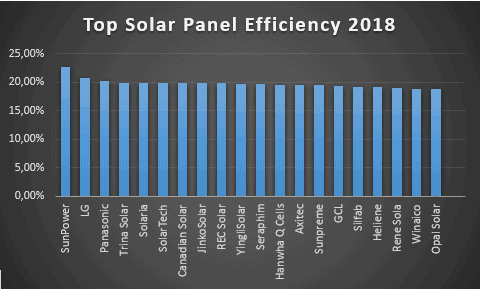 Here we have developed our own top solar panel efficiency list according to the latest product releases of 2018. The temperature coefficient is another common rating used to compare solar panels. They are referred to the changes in power, voltage, and current of the module due to the changes in operating temperature of the module. There are three of them in every solar panel. The most negligible is the current temperature coefficient because changes in temperature do not represent important changes in current. There are also the voltage and power temperature coefficients which effect is deeply important because changes in temperature can have a radical impact in voltage. If temperature increases, voltage drops, while if temperature decreases, voltage increases. Solar panels with low power or voltage temperature coefficients are extremely desired because they mean that the voltage will be less dependent on ambient temperature values that are extremely variable. The solar panels with the lowest temperature coefficients of the industry are the HIT modules from Panasonic with a value of 0.258 %/°C. Tolerance is another rating value of solar panels. It is referred to variations in power output due to manufacturing differences that could lead to less or more power than its nominal power rating. Older solar panels established variations on tolerance from negative values to positive values. Eventually, developers realized that solar panel’s power output was within the tolerance range but generally closer to the negative values. This reduced the performance of the PV array and created disagreement and unpleasant experiences for developers in large-scale projects where the effect of tolerance is more important. Some people believed that solar panel manufacturers deceived developers in the power outputs of their modules which put at risk the confidence in the industry. Therefore, today solar panel manufacturers must establish their tolerance value from 0% to a positive number. That way if the power output varies in the tolerance range, it will only imply a positive addition to the PV array. Finally, there is another rating by solar panel manufacturers that is not related to the technical characteristics but to the economics of the company that manufactures the modules. The tiering system is a list of the most reliable and financially stable solar panel manufacturers in the world. The list is very important for developers who wish to install a large PV system and may need funding from banks to install the solar power plant. If the solar panel selected for the power plant belongs to a brand that is included in the list (like Trina Solar), then there are higher probabilities that the bank will provide funding for the project because the quality, bankability, (useful for claiming warranty) and manufacturing process of the company have been verified to guarantee that the modules will perform perfectly over the 25 years of the power plant. Some financial entities like Navigant Research create their own Tier 1 list, however, the only reliable and commonly accepted list comes from Bloomberg New Energy Finance, and it is not cheap. For homeowners, it makes no sense to purchase the list, but for a developer, it may be crucial and may be worth the investment.